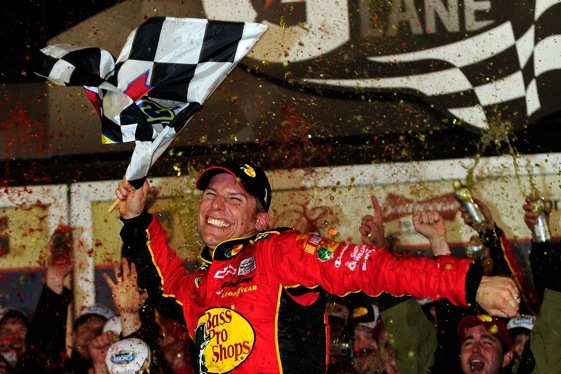 Daytona Beach, Fla. – The finish of the race that seemed to take forever was worth the wait. Jamie McMurray, NASCAR’s newest restrictor plate ace, held off Greg Biffle to win Sunday’s Daytona 500 in the second overtime period while comeback-minded Dale Earnhardt thrilled the crowd by charging from 10th to second on the final lap. McMurray, making his first NASCAR Sprint Cup start in his return to Chip Ganassi’s team, added the win in the stock car series’ Super Bowl to plate victories he had in the July race at Daytona International Speedway and Talladega in the fall. He couldn’t hold back the tears in Victory Circle, breaking up as he tried to answer questions. McMurray, who drove from Ganassi from 2002 to 2004 before leaving for Roush Fenway Racing, He also won his first race as a rookie for Ganassi, taking the checkered flag in the fall race at Charlotte while filling in for injured Sterling Marlin. This was obviously a big win for McMurray, now partnered with Juan Pablo Montoya, who gave the Ganassi team it’s first berth in the Chase for the Cup championship last fall. Biffle, McMurray’s former Roush teammate, was the biggest reason he won and was one of the first people to congratulate the winner in Victory Circle. It was bittersweet for Biffle, who wound up third. For Ganassi, now the co-owner of Earnhardt Ganassi Racing with Sabates and Teresa Earnhardt, this was the biggest win ever for his stock car team, which has been slow to find success. He was asked how this victory compares to his three wins in the Indianapolis 500 and three in the Rolex 24-Hour sports car race? “I can certainly tell you this one is my new favorite,’’ Ganassi said, smiling. “But I don’t know how you rate ‘em. Someday I’ll look back on it and say that they was all great. It was also very important for Earnhardt, who has struggled for the past couple of seasons, to get off to a good start. Team owner Rick Hendrick put considerable resources and effort over the winter to give the sport’s most popular driver a chance to do just that. The 52nd edition of The Great American Race was maybe the strangest of them all. While the green flag was out, the racing was competitive and sometimes spectacular, with 53 lead changes – the third most at Daytona – among a record 21 drivers. But the crowd of about 150,000 that was on hand at the start was considerably thinner as the race day stretched out to more than six hours, thanks to two long red flag stoppages needed to repair a hole in the second-turn asphalt near the yellow line at the base of the track banking. Speedway president Robin Braig said the track was inspected, as always, prior to the race and no problems were found. But the the asphalt came up and the first red flag came out on lap 123 and lasted 1 hour and 40 minutes and 45 seconds. When the racing began again, NASCAR managed to get in 38 laps of furious racing before the patch was pulled up by the speeding cars. This time, the delay was just over 44 minutes. Braig said the falling temperatures and the shady spot on the track slowed the repair effort. He also said the material used for the first patch was the wrong decision. They switched to bondo, an old material for repairing cars, on the second patch that held to the end. The green flag came back out with 35 laps to go and the racing was again fast and furious, with several crashes causing more delays. NASCAR has gone to a green-white-checker overtime in recent years to try to finish the races under the green flag. After the overtime finish of last week’s Budweiser Shootout caused some controversy, the sanctioning organization decided to change the rules to allow up to three green-white-checker restarts. The longest Daytona 500 ever managed to use two of them. The 200-lap race went into overtime when two-time 500 winner Bill Elliott and 2009 rookie of the year Joey Logano crashed and brought out a caution on lap 199. There was another green flag on lap 203, but Kasey Kahne, Tony Stewart – now 0-12 in the 500 – three-time 500 winner Jeff Gordon and Robert Richardson crashed before the leaders could get to the white flag. Finally, the race ended on the second overtime as McMurray won for the fourth time in his Cup career, giving NASCAR’s biggest race it’s ninth different winner in the last nine races. Clint Bowyer finished fourth, followed by David Reutimann, Martin Truex Jr., Kevin Harvick, who led at the start of the first overtime, and 2009 Daytona winner Matt Kenseth. Four-time defending Cup champion Jimmie Johnson, a former 500 winner, was among the leaders most of the day, but wound up 35th with a broken axle on lap 185. I’m so glad McMurray won it…he somewhat reminds me of Mark Martin–very well-liked, plus he’s accomplished so much more than his stats would suggest. Also, I won’t miss those x-pipe exhausts. When the restrictor-plate size changed, so did the camshaft profile. This eliminated the x-pipe’s advantage.